Dr. Rothwell and Dr. Lenick prefer doing white fillings wherever possible. They have several advantages over silver amalgam fillings. White Fillings bond to the tooth, making the tooth stronger. 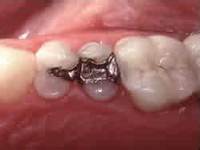 Silver amalgam fillings just fill up the hole. Over time they can expand just slightly and contribute to breaking off parts of your tooth. 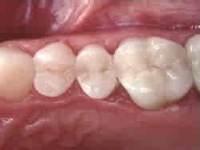 The white composite fillings don’t conduct heat or cold the way metal ones do. If they are done right, there is either no sensitivity in the tooth afterward or very little. Because they bond to the tooth, they don’t require a minimum thickness or size for strength the way silver amalgam does. When repairing decay, Dr. Rothwell or Dr. Lenick will grind away much less of the tooth when using composite than when using amalgam. Since it is sealed to the tooth, composite keeps bacteria from leaking in around the fillings. White composite fillings look much nicer than black silver amalgam ones. Composite requires more time and expertise to place, and the materials are fairly expensive. They will cost more than amalgam, and generally dental insurance plans don’t pick up that extra cost—the difference is up to the patient to pay. We have found, however, that most patients strongly prefer the white and understand the need to pay a little extra for the best possible care.